The heat was rising on a cold February evening as the anticipation grew for live music tonight Southern style. Before, Devon, the local acoustic guitarist Kev Andrews warmed the stage with his recognizably deft guitar work. Kev made the six-strings zing especially with his acoustic re-working of Voodoo Chile. With a mix of authentic blues, slide playing that entertained using a glass from The Flowerpot bar we were musically warmed for the main act of the evening Devon Allman. A grand entrance to a packed Flowerpot, and as usual Devon Allman dazzled everyone with his glorious guitar playing. No gimmicks, no pedal board just straight into the amp and his magical ability to manipulate the six strings of his Gibson; producing a mixture of tones from deep with the blues and the energy of Southern Rock this was a spellbinding set from Devon and his band. Opening with Wash in A serving as the invitation to enjoy Devon Allman and his band on a whirlwind of notes that shaped the mood and we were ready for the party. Leading into the first of three tracks off his current album Ragged and Dirty; including Half The Truth, this is a track that curls around the manipulation and shaping of the fret board. Tonight adding to the honey dripping vocals was Bobby Schneck Jr on guitar taking the lead often his playing is monstrous what a pairing plus great harmonizing on and backing vocals. The rhythm section that sounded like they had been playing together for years. The reality was so very different joining regular drummer Anthony Nanney was bassist, Carl Stanbridge on his second gig with Devon. We were treated to Devon doing a Devon Allman Honeytribe cover Mahalo. The music was scorchingly hot with No Woman No Cry via Bob Marley and The Wailers heard in Derby. This was the perfect time for audience to join in on the chorus; the absolutely delicious licks and riffs contained within Back To You within the great blues undercurrent. The music of Devon and the band hits you deep in your music solar plexus, massaging your soul creating that huge smile of delight of hearing stunning live music unfolding in front of you. Many remembered the last time Devon was at the Flowerpot with Royal Southern Brotherhood so the inclusion of Left My Heart in Memphis was thoroughly enjoyed. The blues that chugged and coursed around the venue, the wonder of Checkin On My Baby from Sonny Williamson via Junior Wells hit the spot. Midnight Lake Michigan from Ragged and Dirty closed the set the lights dimmed they left the stage. We collectively drew our breath and then in harmony yelled for more. Encores can be a number or two added to the set list. No Devon and the band hit the stage as if starting again rather than drawing the evening to a sedate close this was Rock n' roll at its best. 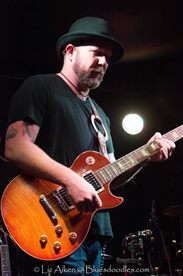 We were treated to a triple caress of the power of Devon Allman. The title track of his latest album led into a medley of music, colouring book of pop, rock blues and everything in between. The fastest version of Stairway To Heaven with the audience joining in the fun. This was a riff medley of huge proportions, a jam that had energy shape and a purpose. I think I picked out Sweet Home Alabama. Whole Lotta Love and Smells Like Teen Spirit many more I missed, when you are that enthralled by the sound your brain forgets to take note of tiny details. Closing an evening we would like to have just continued was One Way Out an Allman Brothers Number that we all loved and left Southern Rock and the legacy of Allman's family talent resonating in the venues air and seeping into the walls as part of The Flowerpots DNA. A magnificent ending to a fantastic gig – WOW! – this was certainly going to be one if not the Bluesdoodles gig of the year.